I’ve loved Eric Carle’s The Very Hungry Caterpillar ever since I was a child which is lucky since I’m often asked to read it several times a day. 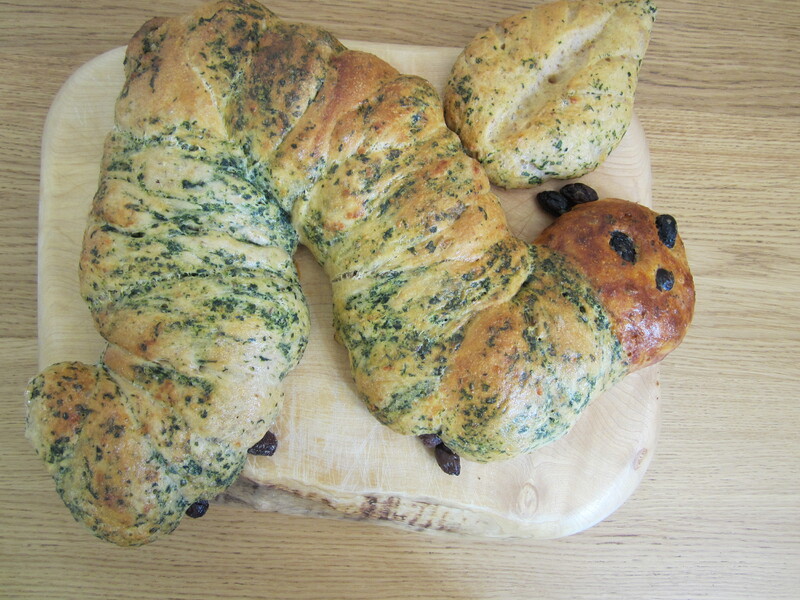 I decided an Eric Carle-inspired Saturday morning baking session was in order with this ‘tear-and-share caterpillar bread’. I made the basic dough on Friday night and left it to prove in the fridge overnight. This meant all the boring bits were out of the way before getting the children involved. After breakfast I added some cheese to the dough and cooked some frozen chopped spinach, squeezing the excess water off through a fine seive. At this point my eldest wandered over to ask “what are you making Mummy? Bread rolls?”. “I’m making caterpillar bread”. That did it. High/chairs were drawn up for him and the baby so they could watch. The baby was less excited about the whole thing and promptly jammed his finger in the kitchen drawer. Otherwise it went smoothly. 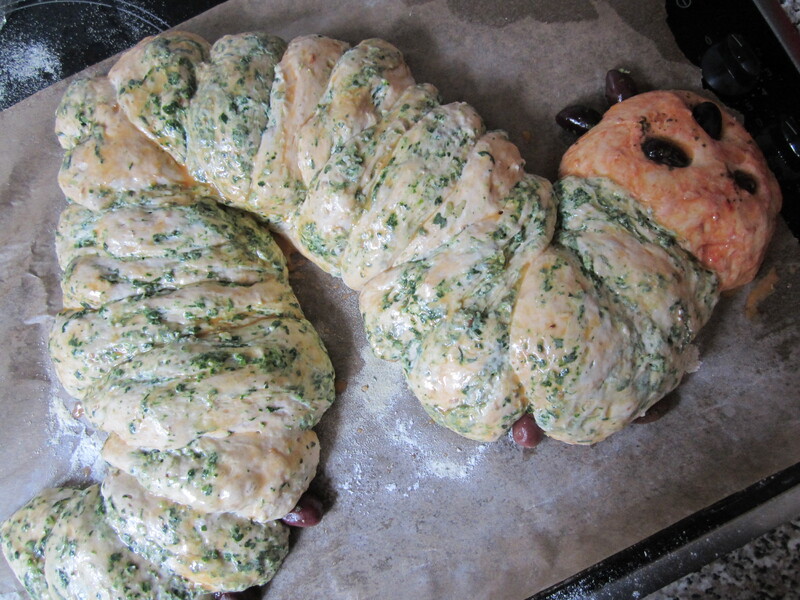 We separated some of the dough off to make the caterpillars head and dyed it red with tomato puree. 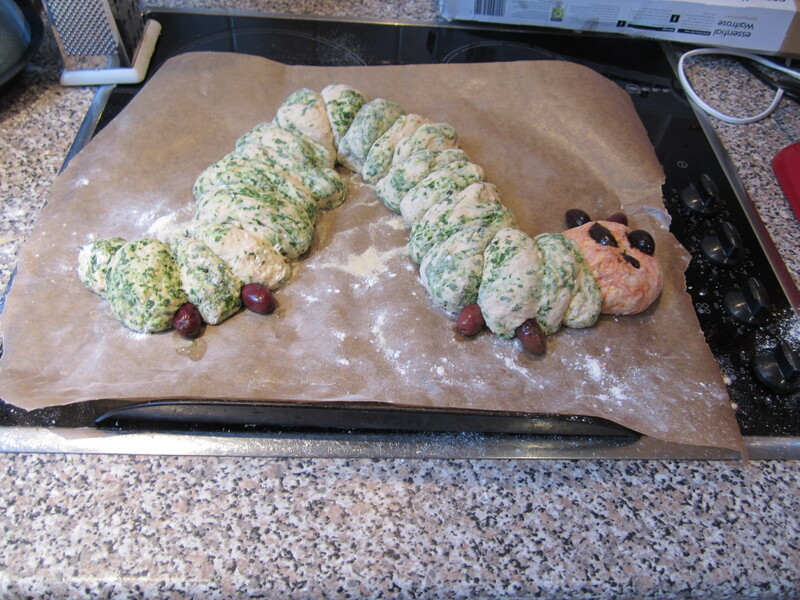 I kneaded the spinach into the bulk of the dough to make the caterpillar’s body and one nice green leaf. We used kalamata olives for the eyes, nose, antennae and feet. We went out for a walk to allow our caterpillar to become a big, fat caterpillar and returned home not a moment too soon as he was almost too big to fit in the oven! Oh Bread-rah, that is just so cute. That is fantastic, what a good idea! That looks fab! Sadly dd1 would never eat bread with green bits in it! That looks amazing! Just found your lovely blog. I’m really enjoying reading your posts. Oh mine would just eat the raw dough so I haven’t let them loose on kneading yet (and I tend to cheat and use my KitchenAid anyway)!